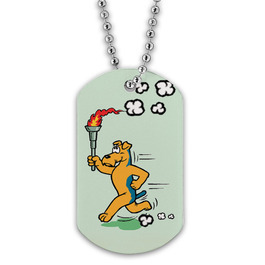 Introducing… Full Color Dog Tags! Put your own artwork on each dog tag for a custom award. If you’ve happened to sneak a peek at our new Athletic catalog, or if you caught our announcement on Facebook, then you may have heard, but for those of you just finding out, our newest product line is now available: full color dog tags. 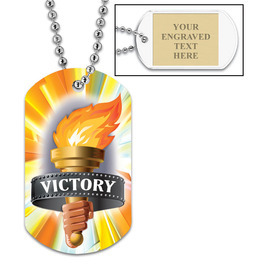 In addition to fully-custom dog tags (where you use your logo or artwork), our art department has designed stock images for individual sports. Coming in August with our Scholastic catalog, there will also be new designs for academic achievement. Want to use them for a horse or dog-related event? We’ll be happy to add your group or show’s name to a stock design for your own unique and custom tags. If you want to personalize each dog tag, you can add an engraved plate to the back for just 50 cents. To those of you that suggested we carry dog tags, we hope you’ll know that we take your suggestions seriously. And if you’ve got a product idea we should look into, be sure to let us know! This entry was posted in Hodges Badge Company and tagged custom dog tags, engraved dog tags, full color dog tags, Hodges Badge Company, new awards, sport dog tags. Bookmark the permalink. ← Need some Red Ribbons?